THE RISE OF THE MINIMALIST MILLIONAIRE | "Global Possibilities"
Aside from its inherent space and energy efficiency, compact living–or rather the high density living that often accompanies it–has been credited as being a catalyst for innovation. In his book Triumph of the City, Harvard economist Ed Glaeser found that when a city doubles in size, productivity and innovation per resident increases by 15%. His thesis was that because people are constantly in collision with one another, sharing and expanding ideas, cities make fertile environments for innovation. More specifically, he said the ideal condition for innovation was 100 people per acre. One person who took Glaeser’s idea quite seriously was Zappos.com founder Tony Hsieh. He took it so seriously that a few years ago he helped spur the Downtown Project. With the help of various Glaeser-inspired urban interventions, he sought to transform Las Vegas’ haggard old downtown area into one of the world’s leading innovation centers. One way the Downtown Project went about achieving their 100 person per acre ideal was to convert a vacant lot into an Airstream trailer park, mostly using them as “crash pads” for visiting coders. No one can accuse Hsieh of lacking conviction in his beliefs. Not only has he put $350M of his own money into the revitalization project, but he is living in one of the thirty trailers–sharing the 200 sq ft space with his pet Alpaca. 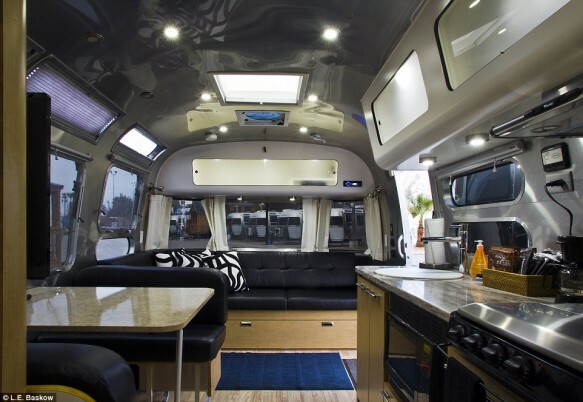 Like the MacMannis’ Airstream we looked at the other week, Hsieh isn’t exactly slumming it. The trailers are all recently renovated and nicely appointed. Nonetheless, for a man with a net worth of $840M, this is a very modest home. While some could charge him and other people of means as tourists in the realm of small space, minimalist living, I think they are showing something else. The merits of small, simple living are something anyone, rich or poor, can benefit from. Consequently, we are seeing more people who can have all they want choosing to live with what they need.